The UK’s political parties are now in full campaign mode following Theresa May’s announcement of the general election which is to take place on 8th of June. With the election fast approaching financial journalists are out in force commenting on what the result’s implication could be for sterling, the FTSE and investors’ portfolios. These headlines are counterproductive to investors as they encourage short-sightedness, and some will unwisely attempt to take advantage of this unpredictable binary event. As 2016 proved predicting the outcome of elections, and their impact on stock markets, can been a fickle task. Future returns of the UK stock market cannot be predicted based on the result of the general election or which party is in power and making binary bets on the outcome can lead to probabilistic results. One thing is for certain, general elections create uncertainty in the market, in turn leading to higher volatility and in some cases this can be priced in as a discount. In the coming weeks we therefore anticipate an increase in volatility and possibly a deceleration, even a possible weakening of UK markets. However these are likely to be shorter term trends and changing portfolios based on these would be unwise. 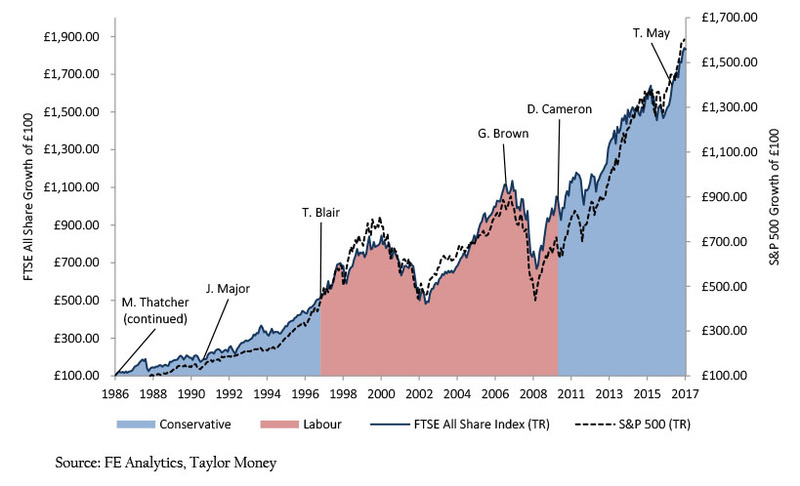 The chart below shows the growth of £100 from 1986 based on the monthly total return from the FTSE All Share Index. The blue shaded segments indicate when a Conservative government was in power, and red denotes periods of Labour government. At first look, it suggests it’s preferable to be invested during a Conservative government over that of Labour. Further analysis supports this, over the period from 1986 the historical average monthly return under the Conservatives has been 1.11% compared to 0.54% under Labour. Therefore an investor could come to the conclusion that they should overweight to UK equities if a Conservative government is in power. The performance of the UK market is more susceptible to global factors rather than that of the UK government’s policies. The performance of the index needs to be put into a global perspective. Showing the S&P 500 total return over a similar period highlights that large and significant movements in the market are not unique to the UK and tend to move in line with the US. Despite two considerable drawdowns under a Labour government if you had chosen not to invest in this period you would have missed out on approximately a 100% return between 1997 & 2010, and therefore the growth of £100 since 1986 to 2017 would have only been to £800 rather than £1,732. In conclusion we believe the general election will create some short term political uncertainty and markets could exhibit higher volatility. However we take a long-term view to investing, ignoring short-term noise and instead continuing with our longer term investment strategy.